I have been a snack monster recently. I eat small meals and eat snacks in between. I noticed that if I start my day with high protein foods, I can better control the hunger pangs that I get all day long. Before pregnancy, on days that I was very rushed, I can survive on black coffee with a slice of toast and banana on the go. I consider that a light breakfast and I usually would eat a heavier lunch to make up for it. But now, eating toast feels like eating air in my current state. What I mean is, it doesn’t fill me up and I need a more dense breakfast to satisfy me. 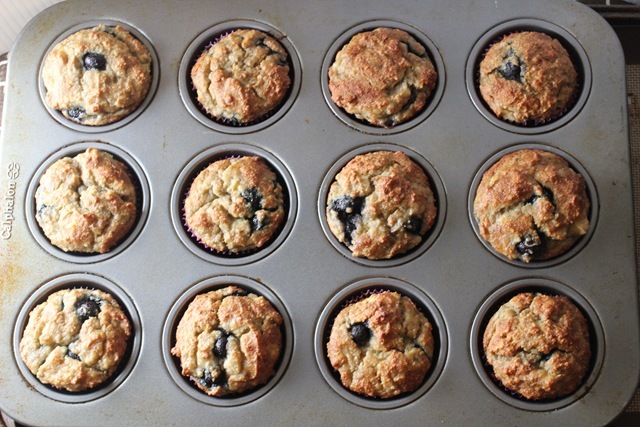 I baked these muffins made with almond flour as my grab and go breakfast for the week. I usually grab one muffin, boiled eggs and a fruit on my way out to work. 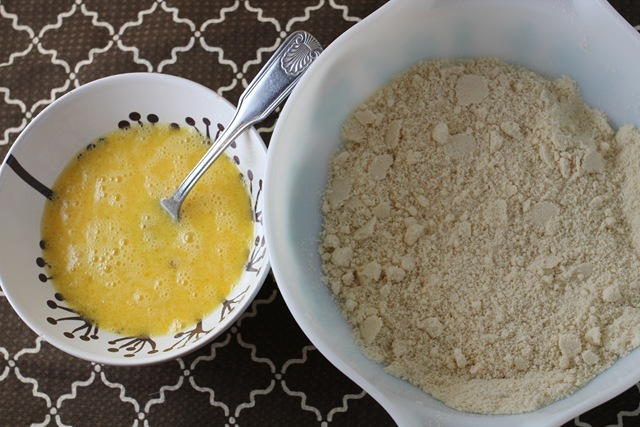 Almond flour has become a pantry staples for me now for a few years. I love using it for dinner recipes like our favorite eggplant parmesan, but I’ve also used it baking muffins and cookies. I like variety and I like experimenting, so switching it up between almond flour or wheat flour is fun. I have both kinds of almond flour, the blanched almond flour (I like Honeyville brand) and almond meal (Trader Joe’s kind is a good value). 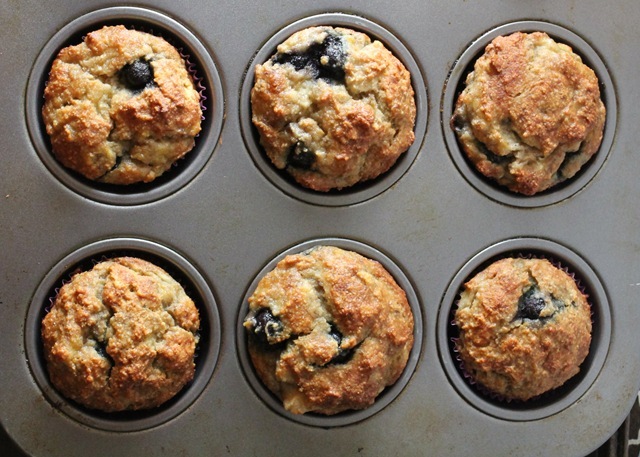 These muffins have no added sugar, all the sweetness comes from the fruit and I love it just the way they are. 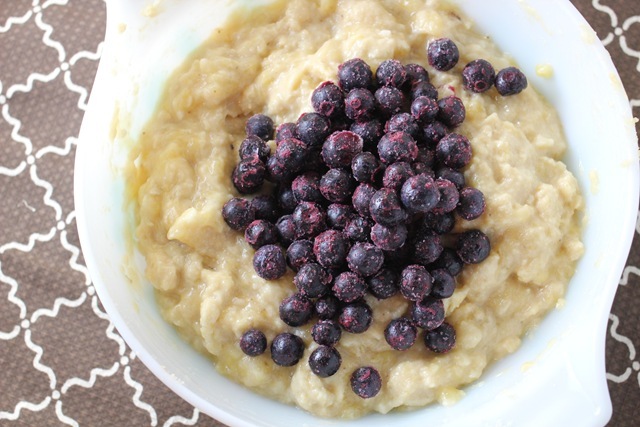 – In a large bowl, combine the almond flour, salt and baking soda. In a medium bowl, whisk together the grapeseed oil and eggs. 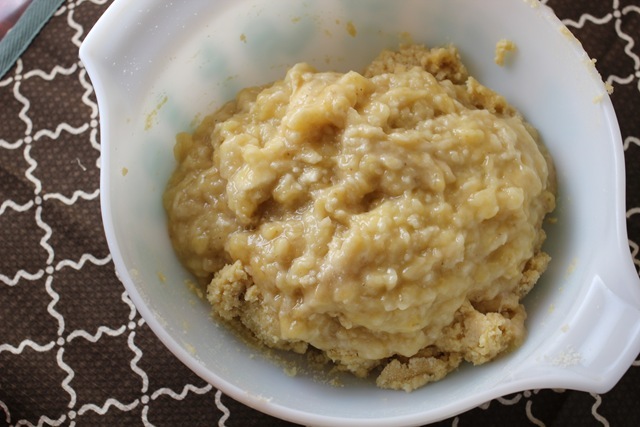 – Stir the wet ingredients into the almond flour mixture until thoroughly combined. 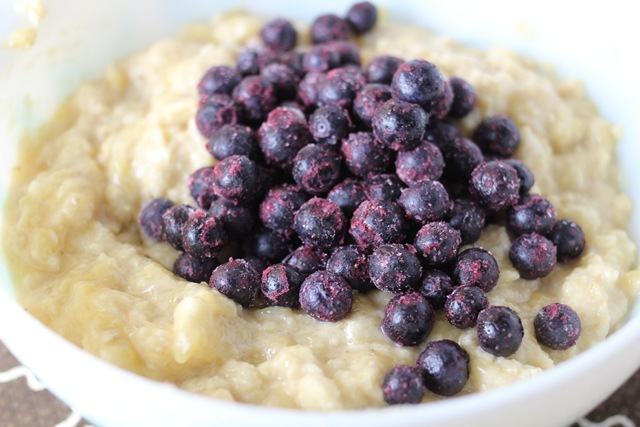 Stir the bananas into the batter, then carefully fold in the blueberries (you don’t want a purple batter). Spoon the batter into the lined muffin cups. – Bake for 35 to 40 minutes, until the muffin tops are golden brown and a toothpick inserted into the center of a muffin comes out clean. 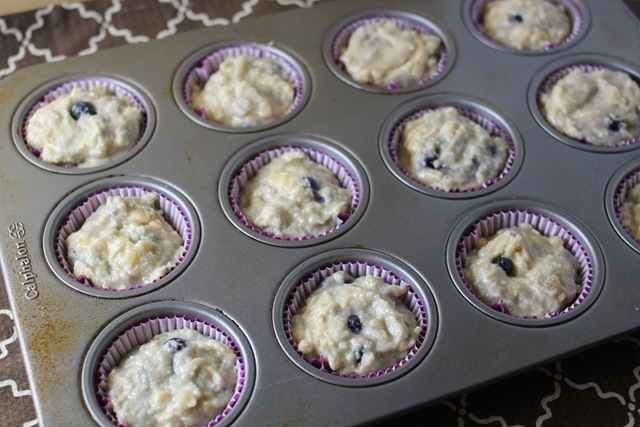 Let the muffins cool in the pan for 30 minutes, then serve or store in the refrigerator. Here are some snapshots during the prep process. The muffin tops look SO good!! I love how few ingredients there are. Delicious! The muffins look perfect! Great shape and I bet the texture is awesome!! This looks easy and yummy a combination I find irresistible, beautiful pictures! This looks easy and yummy, a combination I find irresistible. Great pictures! what are the macros for these? I don’t have any grapeseed oil. I’m guessing that coconut oil would not be a good substitute for now? I’ll likely buy some grapeseed oil soon, since I quickly researched it and see that it’s a good alternative to corn oil (which I usually sub with coconut oil but sometimes the coconut taste conflicts with what I’m cooking!). Yummazing! Just made these, super easy to make and they are delicious. I used canola oil because I didn’t have grapeseed oil & I added some cinnamon (about a tablespoon) to the batter and sprinkled a little cinnamon on top of each muffin before baking. Hi Lea. Your blog is awesome. Thank you for introducing me to this recipe. I made it once. Awesome. I have since created my own similar recipe. This was my inspiration. 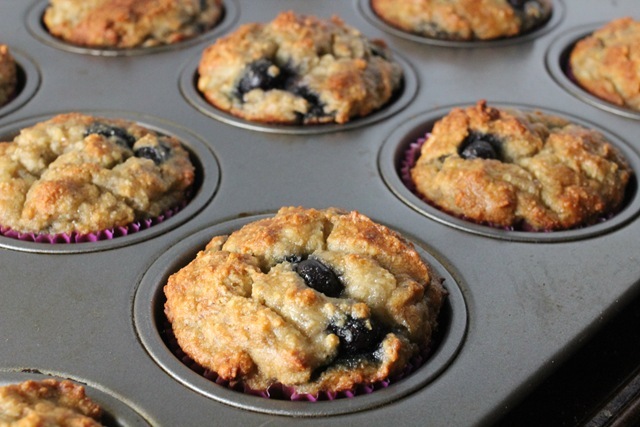 You can check it out here: http://typeonetyler.com/2015/12/07/low-carb-banana-blueberry-muffins/. I left a link to this page in the footer of my post. Be well! Lea, thank you; these are fabulous muffins. I discovered this recipe last night and went to sleep dreaming about them; made them first thing this morning for an Easter treat. 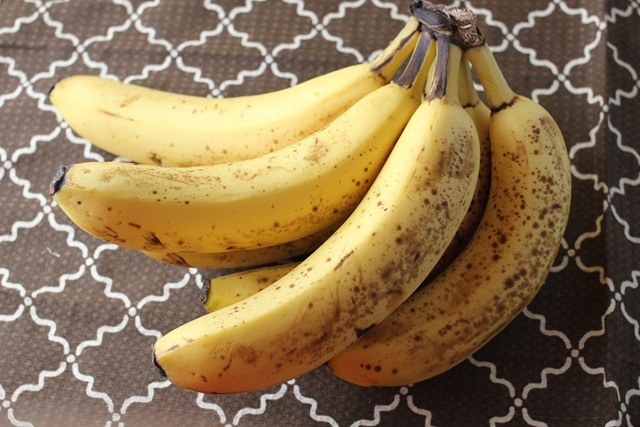 I love how many bananas are used and appreciate that there’s no need to add any sugar as the bananas sweeten these to perfection. As you are a recipe designer I’m thinking you might roll your eyes a bit when people say they changed this or that. But as a recipe reader I so appreciate those comments. So…I only had 1 1/2 cups mashed bananas so I made up the difference with a half cup unsweetened applesauce; I added 1 teaspoon vanilla extract and 1 teaspoon cinnamon; I don’t have grapeseed oil so I melted and cooled 2 tablespoons coconut oil instead; and, I used Trader Joe’s almond meal (which isn’t blanched). I was excited to try out the silicone muffin liners I’d bought recently and I sprayed the insides well with Trader Joe’s coconut oil spray. Because the silicone liners are a little smaller than standard muffin tin holes, I ended up with 14 muffins and they baked perfectly in 35 minutes. I’ve read other commenters say they “inhaled” a baked treat because it was so good — but I’d never done so myself until today. Your muffins are over the top scrumptious. Thank you so much; your recipe will be often made and shared. I just made the muffins! They are SOOOO good!